I’ve been called upon to make quite a few puddings recently. Puddings are not a frequent occurrence around here so it has been fun trying some new things. I managed to sign up to make not one but two pavlovas for our pre-school’s quiz night. 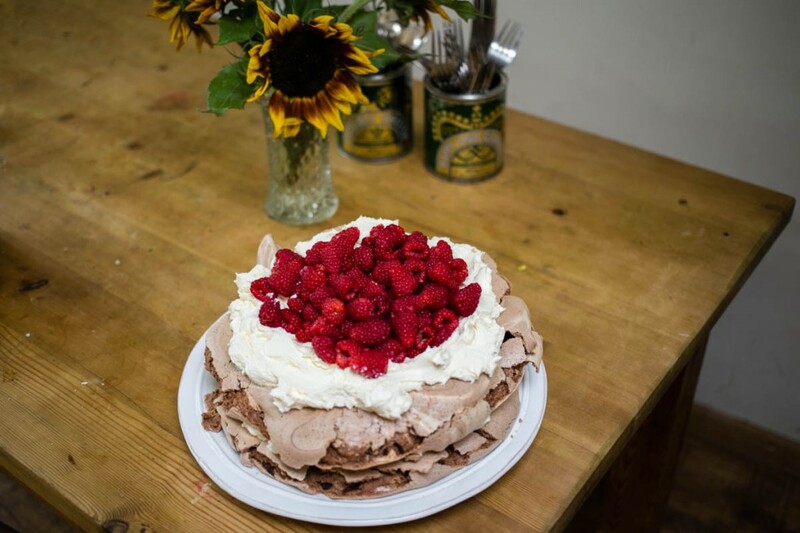 I decided to mix it up a bit and make a chocolate and raspberry pavlova alongside them traditional white meringue and strawberries. The chocolate meringue expanded more during cooking and had a more cracked exterior but it was incredibly more-ish. Having been asked for the recipe by a few friends I figured it couldn’t be too bad. 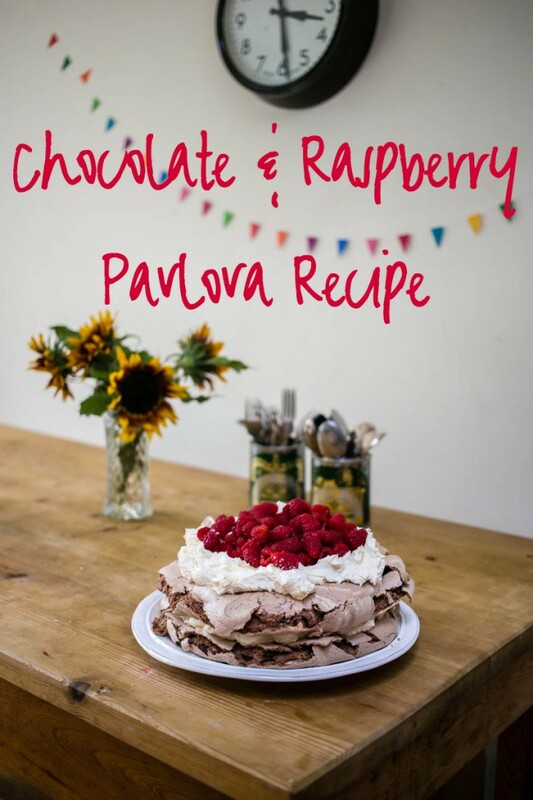 If you keep some frozen berries on hand you can whip this up with a few store cupboard ingredients and a tub of cream from the local shop. If they are available, fresh raspberries go very well with the deep chocolaty marshmallow of the meringue. 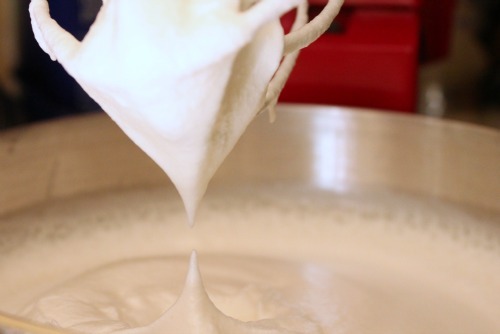 Whisk the egg whites until they form stiff peaks (as in the picture above). Add the sugar a little at a time, whisking until the mixture is shiny. Add the vinegar and gently fold through the meringue. Next sieve the cocoa powder over the meringue a little at a time gently folding it into the meringue with a metal spoon. 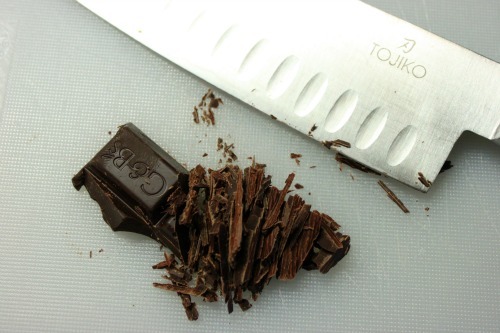 Once the cocoa is combined, fold in the chocolate and turn out the meringue onto the baking sheet making either a square, oblong or circle (depending on how you want to serve it) shape that’s even across the top and has a bit of space left around the edge. Gently place the tray in the oven and turn down the heat to 150°C. Leave to cook for 1 hour and twenty minutes. Open the oven and check the outside is nice and crispy then turn off the oven, leave the door open a little (if safe to do so) and leave the meringue to cool in the oven for a few hours, overnight if you can. 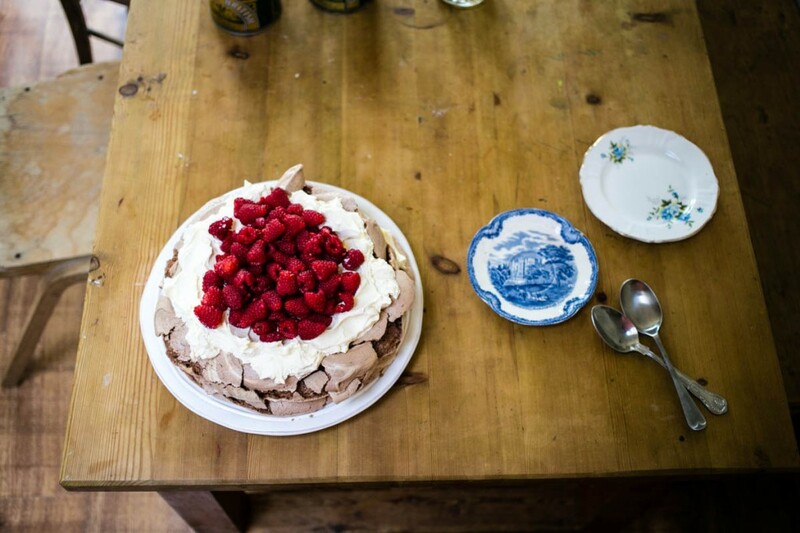 Whip the cream until it is soft yet firm, spread it over the top of your meringue leaving space around the edge. Then arrange your fruit on top either willy nilly or in neat circles depending on your temperament. Shame I haven’t got any eggs left..this looks delicious! yum! 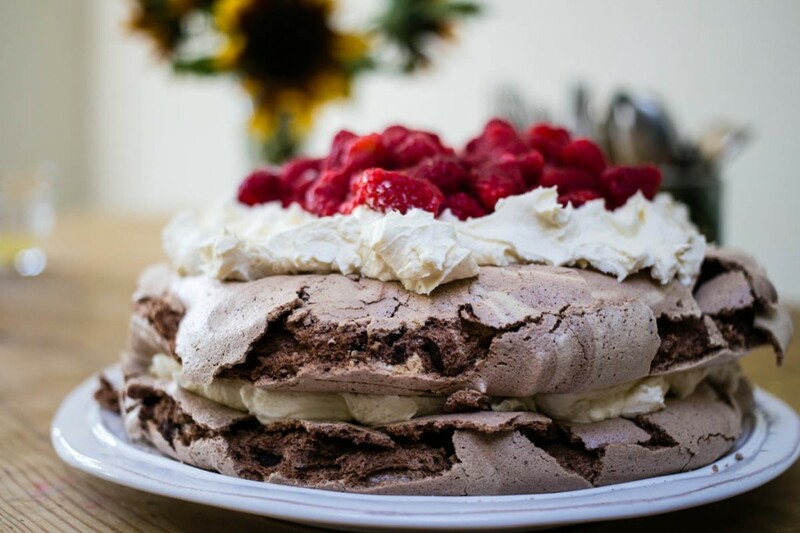 love a chocolate meringue. V moreish as you say. A bit too moreish for my own good I think! !